I tripped over a reference to this artist and wish I had known of her work at the beginning of this Assignment. Falkenstein’s work is included in an exhibition opening in a couple of days in Los Angeles – Revolution in the Making: Abstract Sculpture by Women, 1947 – 2016 (link). In her oral history Falkenstein talks about the vocabulary she developed – “the never-ending screen, the sign and the ensemble, topological structure, lattice structure, and then the combination sometimes of any two or any three”. She later explains more about each: “a topological structure in the sense that all of the curving parts of the tubic structure makes the idea of penetration and then surfacing”, and “the surface becomes the interior”, with constant motion; “the sign in the ensemble, because the sign is the sign of the “u” and it’s in repetition over and over, which would be causing the ensemble”, by which I understand the sign is a chosen unit, and then multiples in a pattern or rhythm or continuance form the ensemble. Interval, harmony and relationships are important. The never-ending screen is a lattice Falkenstein developed which has the movement of topological structure and also allows vision, transparency. Instead of a single visual focus there could be innumerable moving focal points in an expanding space. One of the exciting things about this form is its ability to move from quite shallow to very three dimensional. Falkenstein found freedom in looking within for inspiration and meaning, using external models as a point of departure allowing her to express what she felt about the model, rather than attempting to represent its form. Feeling and expression – definitely not copying. While influenced by the wider world, by looking within she was able to establish her own identity. I find Falkenstein’s explanation of her vocabulary and the importance of looking within fascinating. These fed her creative energy and direction, and she was still working actively, continuing to explore, excited about her results, in her eighties. I also was struck by a description of some of her works “which explore motion, by either rotating, falling, sliding, turning or interlocking” (Larinde, p. 51). This seems to link to some of Eva Hesse’s work in not-exact repetition, and also reminds me of methods of developing designs for continuous fabric patterns. 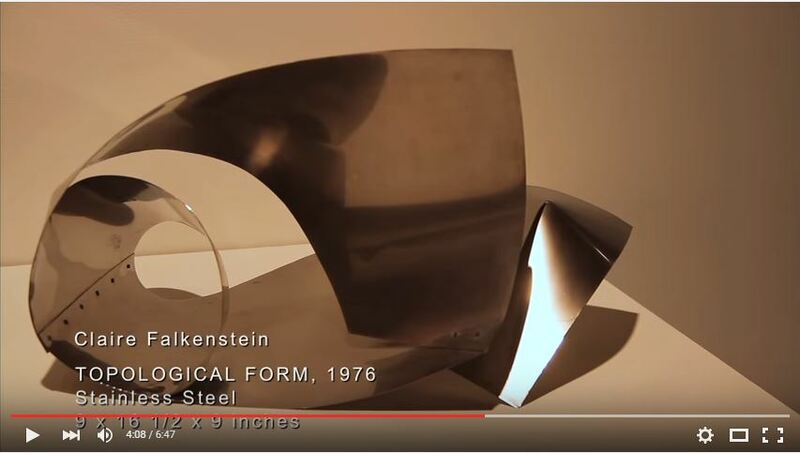 Falkenstein was experimental in her use of materials, such as aluminium, plastics and welding, and in her forms and techniques. This seems very relevant to my current course – although unfortunately a little late to take too much advantage. The phrase “enclosing space with line” (Larinde, p. 52) had me thinking of sample p5-4 (31-Jan-2016), suggesting ways of developing the strong lines of stitching and the voids and semi-transparency of the distorted organza. It also fits with original intention of exploring space with the presentation of my collection. Possibly a few samples, such as p5-33 (6-Mar-2016) move towards that goal, but I think a re-focus may be necessary. Falkenstein made a number of fountains, and I find Larinde’s description of the approach interesting: “a form that forced her to think in terms of the unity of structure and the flow of water so that there would be no dispersion, no separation of the liquid from the fluid metal” (Larinde, p. 53). Earlier this week I had an invigorating conversation about the possibilities of photographing my pieces in a flow of water (thank you Claire! ), but so far I haven’t come up with an idea that seemed workable and with bearable risk to equipment. Of great interest to my presentation concerns is a video of an exhibition presented by Jack Rutberg Fine Arts in Los Angeles, “Claire Falkenstein: An Expansive Universe” https://www.youtube.com/watch?v=mr0oUaBUkkA. A still of that video is shown below. The objects themselves feel almost familiar to me. It feels presumptuous to write that Falkenstein’s Topological Form reminded me of the curves of p2-18 (19-Jun-2015). The presentation of works in the exhibition dovetails with my early imaginings of what I wanted to simulate in my work. Finally the video itself, the way it presents the collection of works in context with each other and then examines each one from a distance and closeup is inspiring – although entirely beyond my equipment resources and skills. 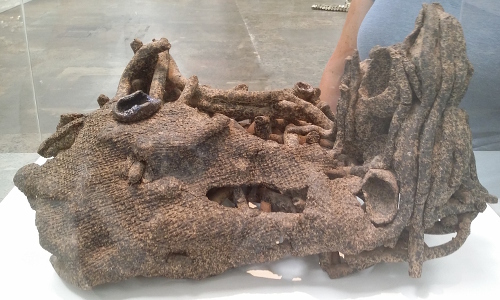 Yesterday I visited El Anatsui: Five decades at the Carriageworks. There are a few previous mentions of his work in this blog: 27-Aug-2012 seen at the 18th Biennale Sydney: all our relations and discussed in the context of “Textile Art” research; 27-Mar-2015 as an example of surface distortion in research for assignment 1 of this course; and 29-Aug-2015 when I used the quote “He feels it is important to work with a newly discovered medium until you really understand it and can “get something intrinsic out of it” in support of my decision to narrow and deepen my exploration of molding materials in assignment 3. 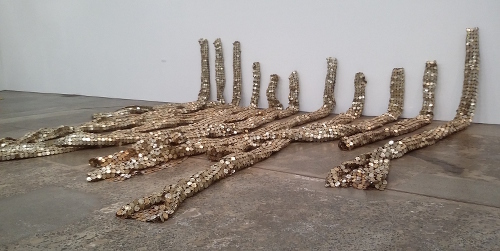 In that final post I also referenced a post by fellow student Nina, on ninaoconnor.wordpress.com which gives an excellent overview and related links about El Anatsui’s work. This post is going to focus purely on what attracted my attention as related to my current project, An exploration of materials and space, also known as a collection of vessels. At one end of a large space there were a series of objects. They were made at different times – 1979, 1987, 1995. They used a variety of materials – most manganese, but also oyili-oji wood and black afara wood. The spaced arrangement, the height, made it easy to walk around, to peer into the works. It also tended to homogenize them, to isolate them. This would not be an effective method to display a collection as an interacting group of objects nor to explore space. Waste paper bags is clearly a single work consisting of multiple elements. I find this presentation of the work particularly evocative. Anatsui’s work frequently references waste and recycling. Here it is presented in a building which was in a sense waste, when no longer required for building and maintaining railway carriages, and which now has been “recycled” into a contemporary multi-arts centre. The original fabric of the building is largely intact, with new structures inserted within. The mix of old and new materials of the gallery provides a very appropriate backdrop to Anatsui’s work. The high roof and skylights also allows shafts of light to enter and illuminate the works to very good effect. My own vessels are new constructs of new materials. However the potential of different surrounds and natural light, at least as a supplement, is relevant to my thinking. Viewers are able to move around the works, to peer into them in a very direct way. So far I have been considering my samples as complete at their existing size. Could they be scaled up so that people could walk amongst them? I can’t see that, at least not directly. I have been working with the properties of the materials, and the textures and forms created would not become larger simply by using more of the same materials. They could be made somewhat larger, but not human sized without a translation to other materials. Finally another reminder of the impact of the surface on which the work is shown. An internet search easily finds photographs of it exhibited on marble, on polished work, on blemish-free polished concrete. It’s a little different every time. That’s certainly something I want to experiment with over the next few weeks. Starting with the subjective. I used the image above in the workshop with Ruth Hadlow (25-Feb-2016). The class task: looking at a contemporary art practice that interests you, extract information and turn it into a brief for sampling. (“define parameters” an alternative expression for those who had trouble with “brief”). I used the image above, and also works shown in a monograph by Amanda Fielding. I look at that, and suddenly my mind is buzzing. I’ve written about presenting my collection – it’s always been an integral part of the exercise. In my thinking I’ve been in default mode – white surfaces, different levels, good lighting, conversations between pieces… Look at the photo above – how much more exciting, how connected it is. The table surface isn’t passive, it contributes. The pieces are animated. They aren’t separate any more, but have joined in a much more interesting whole. Stage 6 is prototype/maquette-making, and I think this fits extremely well. I’m getting ahead of myself here. I feel as if things have been spinning in my brain and they’ve come together with an almighty click! I feel I’ve finally done what my tutor asked for in her last feedback – picked apart my research material to find what I can learn from it. Before racing into this bright new future, there is the objective style research I was already doing – still of value and I think an edited version worth recording. The work by Gillian Lowndes shown above is not a vessel and not a collection, but it is certainly an exploration of materials and space. I was led to Lowndes’ work when researching Debbie Lyddon. In an article on textileartist.org (www.textileartist.org/debbie-lyddon-art-that-inspires/) Lyddon talks about influences, including Gillian Lowndes. Lyddon: “What inspires me so much about this work is the way the ambiguous nature of the objects Lowndes made speaks not of things or concepts but purely of the materials and the processes of change used. They are mysterious objects that create connections between many different things. Her work has encouraged me to question, explore and experiment with non-traditional textile techniques and materials and to use the physical properties of materials to evoke a sense of place.” So much of the work I was researching at the time had deep emotional significance, unlike the samples I was actually producing. A focus on materials their physical properties was clearly more closely related to my samples and the material exploration I was doing. Lowndes explored far from traditional pots. She worked in bricolage, mixing found objects and everyday materials in her ceramics, transforming all through high heat in the kiln. Lowndes’ work was open, ambiguous. Her work was “about process and the random relationships of different materials” and she stated “I want [my works] to be elusive, mysterious objects which have all sorts of connections to all sorts of different things” (quoted in Fielding, p. 60). Alison Britton wrote “What is the appeal of an object that is like something but is obviously not being that thing? A visual metaphor, a transfer of meaning, is in operation, and there can be a sort of energy, a ripple of understanding in the recognition… ” (quoted in Fielding, p. 75). A wonderful resource is Ceramic Points of View: ‘Cup on Base’, by Gillian Lowndes, a collaboration between The National Electronic and Video Archive of the Crafts and the Victoria and Albert museum (www.vam.ac.uk/content/articles/c/ceramics-points-of-view-gillian-lowndes-cup-on-base/). There are video responses by six people to the work shown at the top of this post. I find Alison Britton’s particularly exciting as she handles the piece while discussing it, giving a sense of the physical presence, the weight and substance, of the work. Britton’s comments include “Very experimental, but it’s not idle experiment, it’s always with a very strong voice … clear purpose.” (this is in the transcript not the edited video). Very relevant to the MMT method and Ruth Hadlow’s class. Included in the video are comments on vessels in comparison to sculpture – I wonder if that reflects a ceramics view of the world, where vessels are normal, traditional, and sculpture is a step somewhere else. Display is also mentioned – something Lowndes experimented with, putting work on walls or mounting it on perspex. Both of these feel very relevant to me as a textile person moving perhaps somewhere different. In terms of my own work I know I haven’t got all I will from Gillian Lowndes. I think she will be a hero of mine for a long time, and I’ll keep returning and finding new points of interest and relevance. For my current project a couple of key points are around combining forms and display and being more confident about exploring materials and process without an attached meaning, and separate from this the video commentaries, which I’ve already experimented with (5-Feb-2016 and 19-Feb-2016). Fielding, A. (2013) Gillian Lowndes Ruthin Craft Centre The Centre for the Applied Arts, Ruthin. In my research for this Part I have identified a number of OCA students who have worked with similar forms – a small group of vessels. I carefully don’t write “similar ideas”. My starting point has been my materials, individually and in combination, and how the resulting objects/vessels interact in space. This is quite different to the artists discussed below, who have all worked from a theme or concept. I’m finding it useful to identify differences as well as similarities. It leads to all sorts of questions to myself about what, why, and what if in my making. In her work for A Textiles Vocabulary Julie continually returns to her underlying interest in concepts of wear and tear, of loss and fragmentation. She feels an urge to engage emotionally, conceptually, to discover or tell a story. Every element of the bowls has significance. The shapes gently cup, holding and protecting while still open, but vary in detail to suggest rawness of emotion or the round completeness of harmony and growth. Colours express emotion, the stifling, endless darkness of loss, the red of fear and suffering, the yellow and green of renewal and growth. Textures appear more similar, given largely similar materials, but still in the detail there are jagged pain and tendrils of tentative growth. Julie regards these works as unresolved, as a starting point of exploration. To me they are very satisfying as they are. It will be interesting to see if she returns to this, either these particular bowls or the general theme and techniques. Will elaboration add greater depth or lose that clear, direct communication of emotion? The presentation of the bowls is a simple rather flat line. It’s a default mode, chosen by Julie to avoid loss of momentum in an ongoing exploration. This lovely work is the antithesis of my current experimentation. In the past I’ve tended to search for narrative and my final piece for A Creative Approach was full of emotions – primarily horror and rage (16-Feb-2013; 20-May-2013). In contrast this current course module has been extended serious play. It feels right for my final piece to be a continuation of that curiosity and sense of discovery. 11-December-2015: On words The poem by Alice Walker and its meaning for Julie. 17-December-2015: When two ideas collideThe three bowls. 4-February-2016: When art and life collideJulie’s insights and bravery deepen. Anne’s final work for A Creative Approach began with an idea – the drystone wall as a metaphor for our lives: “we start with bare walls that are embedded with the fossils of our ancestors, and finish with those walls almost obliterated, but in their place is a profusion of wildlife and microhabitats which depend on the underlying structure.” These ideas and subsequent extensive sketching gave a framework to Anne’s development, but in her reflection she concludes that although she would present it as a series, perhaps “Lifelines”, she would probably leave the interpretation of the work to the viewer. 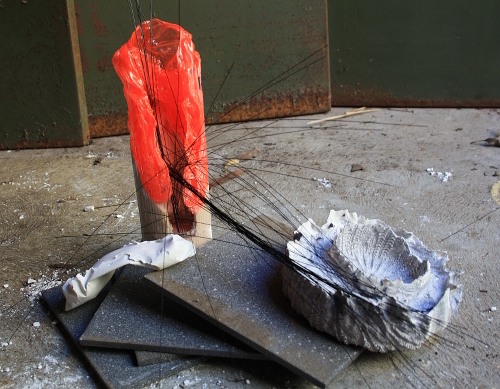 Although connected by theme and a general technique of wrapping and coiling, each vessel in the series takes a different form and uses a range of materials and techniques. There is a progression, from the white, well-shaped vessel of youth to the crumbled mossy stones of age. Underpinned by her research Anne felt free to experiment, opening her mind to new ideas. Anne put considerable thought into her photographic presentation. I believe the version above was based on a suggestion from her tutor, emphasizing the timeline aspect of her series. Personally I prefer an earlier presentation shown below, taken before the vessels were finalised. The external environment seems a better fit with the theme of drystone walls. The tighter arrangement of the pots means they connect more as a group, and mossy old age wraps around and completes the set. I also like being able to look down into the pots, being able to appreciate their three dimensions and construction. Anne’s exploratory approach using a range of materials and techniques is closer to my own experiments. Although her theme may be downplayed if exhibited the proposed title of the work would naturally lead the viewer to consider theme possibilities. My plans don’t include such a framework. I need to be careful to ensure a cohesive group – a collection, not a jumble sale. I’ve been imagining my work displayed in a “white box” gallery simulation, perhaps each in its own space separated on plinths of different heights and lighting to produce exciting shadows and sparks of resin. When Sorting and again when displaying my chosen objects I want to remain open-minded on the balance of individual and group presentation. 30-November-2015: Drystone Wall Project. Reflections. 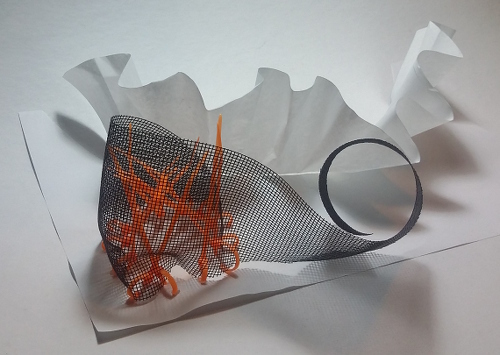 Many others describing the progression of work, including 29-November-2015 and 29-November-2015, which shows Anne’s experimental approach and use of sketching in developing ideas and responding to samples. 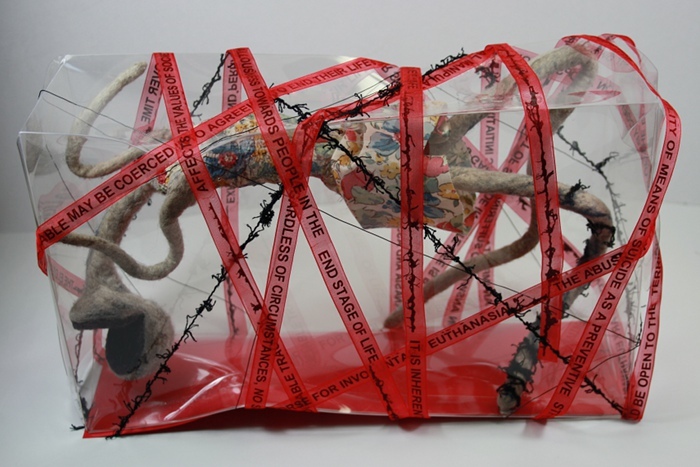 Katie Taylor is working through Level 3 of the OCA course, and her work is clearly at a different level. 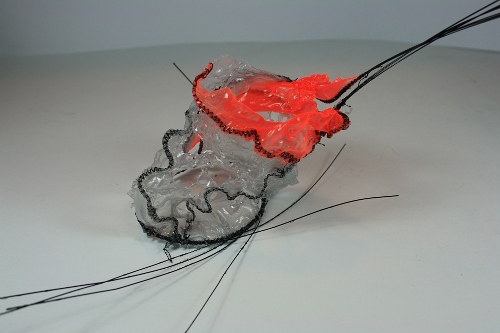 She works conceptually, creating sculptural forms using combining materials not usually seen as textiles. This is done in support of her theme, her over-arching interest being in our precarious existence, the fragility of life and death. “I am not interested in making pretty art, I want my work to move the viewer into asking questions, of the work, of themselves, of their own place in the world”, she states. Katie planned her entire Textiles 3: Your Own Portfolio module as a series of explorations of ideas around women’s social history, death, remnants of what is left and what is after death (5-October-2014). She considered bowls – empty vessels, or coiled and spinning out of control (21-October-2014). Clay impressions brought the focus back to fragility and what is left behind. Presentation was an early consideration (27-November-2014, 25-April-2015). Bowls, spirals and funnels were recurring metaphors. I won’t go step by step through all Katie’s research and development through multiple projects – I recommend her own voice on her blog for that. As a student I’ve found it fascinating to see a body of work being developed using the approach I’m currently learning – for example Sorting, repeatedly (2-July-2015, 16-October-2015). Here of note to my own current work is the repetition and connection of very similar but different vessels. I see this presentation as an effective way to give prominence, interest and visibility to the piece, although I think Katie was dissatisfied. Vessels comprise the major proportion in number items, but they are combined with other elements that bring variety of form and an expansive use of space. The display follows the walls of the gallery, and individual items are angled to take advantage of the relatively limited viewpoints of the visitor. Most of the vessels allow easy access to their hollow centres – a method that I preferred when looking at Anne Dyke’s work. A video – not displaying a piece of work, but the work itself. Katie filmed herself spinning paper yarn by the grave of her parents. 6-December-2015. There is so much in Katie’s work and it is so close and yet so far away from what I am doing. Perhaps my one reservation is the variety. In the exhibition the pieces seem fellow travelers rather than a resolved, coherent collection. I feel the need to nibble at this in small, digestible chunks, taking on what I can without feeling overwhelmed. All images reproduced with kind permission of the artists. Earlier in the week I was at the Art Gallery of NSW for the first of this year’s art appreciation lecture series (theme Collectors & Collections, starting with the Medici), and spent some time earlier looking for collections of vessels. The vessels of this series are linked by the glaze used – celadon on the body and a red glaze giving the impression the vessels are full of liquid. There is a range of form and height, and a sense of sparseness in the unadorned shapes. In this installation the vessels are grouped on a low bench in the centre of the gallery, just large enough to accommodate them. The visitor looks down into the rich transparent red. Individual vessels can be seen clearly, they are brightly lit, open to view, but despite individual beauty it is the group which has primary impact. In contrast other vessels in the same gallery are displayed in rows behind glass within the walls. They are evenly but relatively dimly lit. Each has its own information label. They are related – similar materials and place of origin – but separate. The gallery website for Liu Jianhua’s work shows a different arrangement, the pieces close but not touching, on the floor in the corner of a white room. It is just as effective in showing them as a series. Unlike my proposed collection, there is a depth of cultural references and symbolic meaning in Container Series. 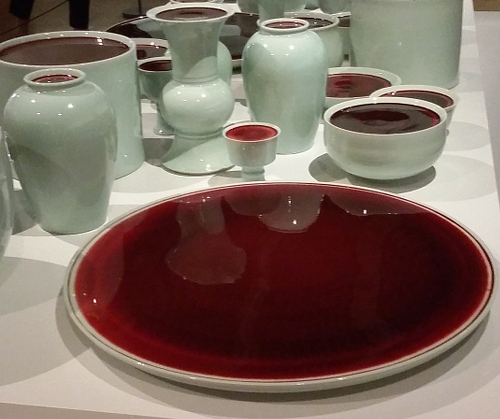 China’s ceramic heritage is referenced in glazes and some of the forms, but combined with other forms and a distinctly contemporary installation. China as a producer of consumer goods, and its position as a growth art market add to understanding, appreciation and meaning of the work. The bottles in Dale Frank’s Ambition 25 + regrets 10 + death 21 = 56 are one part of a larger whole. The grouped placement is significant, referring to the title of the work. In the group of 21 bottles each has a coin placed on top, I assume linking to the tradition of coins on the eyes of the dead to pay Charon. 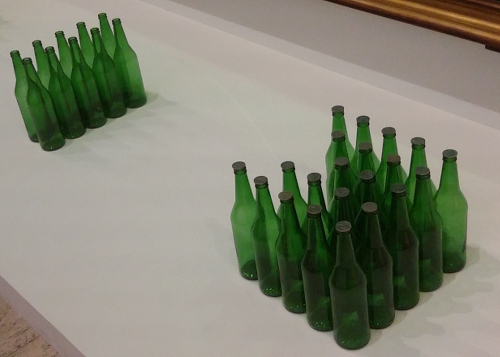 The total number of bottles is the artist’s age at the time. Is this the sum of his life, placed in service to art exemplified by the varnished plexiglass above? I took my photographs at an angle, wanting to avoid my own reflection, but perhaps I should have embraced the opportunity to create my own self-portrait. Given the title, ideas of life and death, this work seems in the tradition of still life, a commentary on a brief and shallow existence. The individual bottles are anonymous, mass produced. The ideas behind the grouping contain the importance of the work – although it is also visually striking, being large, reflective, a glow of colour. I feel uncomfortable about this work, as if I’m not in on a joke or there’s a conversation going on over my head. I don’t see this world of ideas as relevant to my current research purpose, my focus on materials rather than concepts. I wish I could include a better photograph of this work by Fiona Hall. It is stunning. The image on the AGNSW website is sharper, but for me it loses the atmosphere of silent screams, empty eyes, and random body parts. Suspended in dim light are dismembered remains, knit from video tape still connected by an umbilical cord of tape to video cases lying on the ground. They are war films – Hamburger Hill, Apocalypse Now, Gallipoli. “Slash and Burn” can be clearing land, or more darkly, ethnic cleansing. The media glorify violence, and make money from it. The victims are voiceless, anonymous, without number. The AGNSW website includes “Hall believes there is no hope for the sustainability of nature until human beings begin to treat one another with greater respect and understanding.”, but I see no hope in this installation. The use of knitting is poignant. 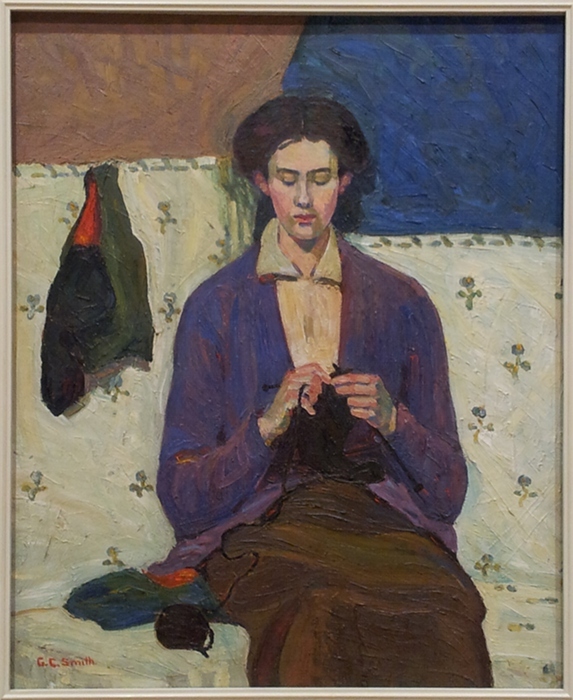 Elsewhere in the AGNSW is The sock knitter by Grace Cossington Smith, showing the artist’s sister knitting socks for troops in World War 1. It is full of colour and quiet determination, comfort and hope. There is nothing quiet or domestic in Hall’s work. Once again I find it difficult to find ideas to bring back to my own work. The individual parts were displayed in a strict grid pattern. There is variation in detail but the similarities mean the parts build as a group to create impact. 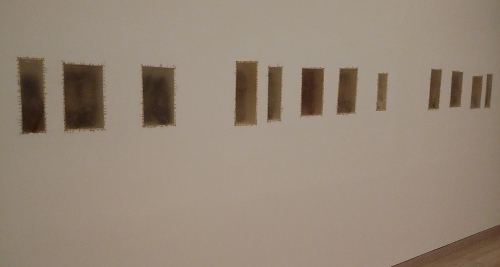 In this post I am presenting works in the order I came across them – the AGNSW is constantly changing and all the works bar Liu Jianhua’s were new to me – and each seemed more serious, had greater depth of ideas, making my student explorations seem trite. I’m posting despite this, in a way demonstrating what my plans are not. However it is the next, final piece which silences me. Here is loss, pain, emotion, violence that I cannot encompass. Presented in niches in the gallery wall, closed away from us by cow bladder stitched with surgical thread, are shoes of women who have disappeared in Colombia. I stand quiet before this memorial.